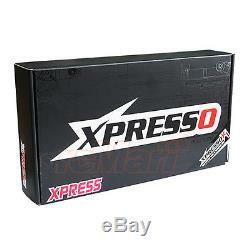 Xpress Xpresso K1 1/10 K Car MR 2WD Chassis Kit #XP-90001. First off, Xpress are releasing the world's first K-Chassis. You must be wondering what is this new "K-Chassis"? Fully Adjustable Upper Suspension Arms, adjustable camber and caster without changing parts. Servo Mount integrated into the front bulkhead, resulting in the mass concentrated near the center of the chassis providing excellent balance. C-Hub less design means less parts to keep and able to achieve a large enough steering angle for RWD drifting. 1/10 Touring Car Sized Differentials, providing excellent on-power grip and consistent acceleration. Carbon Fiber Lower Arms, provides the perfect balance between lightweight and strength. Parallel Topdeck for high on-power grip towards the rear wheels. One piece motor mount and rear bulkhead, reducing the flex caused by high powered brushless motors and LiPo battery. Which in turn will increase the on power grip generated by the chassis. Adjustable battery mount for both regular and shorty packs. Carbon Fiber Gyro Mount near the rear for controlled RWD drifting. 116T 64p Spur included, a 50T 64p Pinion for On-Road Racing and a 22t 64p Pinion for Drifting is recommended when using a 13.5t Motor in blinky (0 timing and turbo) ESC mode. Compatible Bodies: Tamiya's WR-02 Jimny and The LC40 found on GF01 kits. 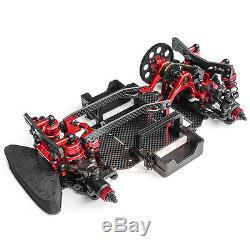 Xpresso K1 1/10 K Car MR 2WD Chassis Kit (1 pc). Xpress 116T 64p Spur Gear (1 pc). Radio system (transmitter and receiver). Low profile steering servo for 1/10. Battery pack (Shorty or Regular). Body, Wheels, Tires and Inserts. The item "Xpress Xpresso K1 EP 110 K RC Cars MR 2WD Chassis Kit Touring Drift #XP-90001" is in sale since Monday, October 24, 2016. This item is in the category "Toys & Hobbies\Radio Control & Control Line\RC Model Vehicles & Kits\Cars, Trucks & Motorcycles". The seller is "rcmart" and is located in HK. This item can be shipped worldwide.